relax, I promise it will get better. If you ply a lot of the overtwist will go away, I promise. 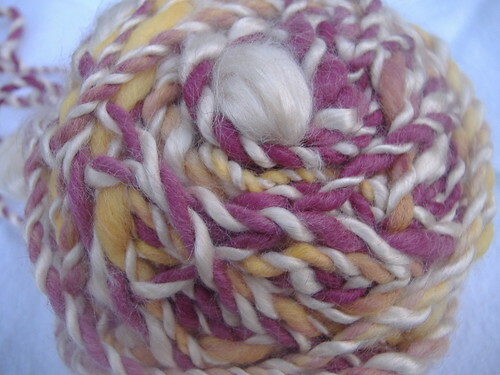 Do you have a picture of your yarn? It'd be easier to diagnose. I'm so jealous. I hope you had huge fun! I second the Etsy notion. I so covet one of these. OMG, I love the yarns this week, so colorful, so creative, so...squooshy! Nutmeg- your yarn is so halloweeny! my favorite. Happy Birthday Jazz Turtle, I hope you get to spend some of your birthday spinning. Come to think of it, maybe not since you are a newlywed. Jadzy, I'm beyond jealous of your trip to Camp Pluckyfluff. I heard rumors of Camp PF coming to Alaska but then I moved away. I didn't get to work on my yarn this weekend. We went camping! Totally worth it. I had a ball watching the leaves start to change here. I missed Indiana. It's super even. How wonderful. Are you addicted yet? What an amazing first yarn! Great job. Wow! I really like the color. Where is your fiber from? I miss Fiber Fridays too! Life has finally just settled down from the big move. I think my favorite this wee is Aussie Ocean. Ooooh, I hope I can dig out my camera and get some yarn on here for this Friday. ITA w/ nicolassa, predrafting makes spinning so much easier for me. HTH!